– communicating changes of the articles of association to public authorities. 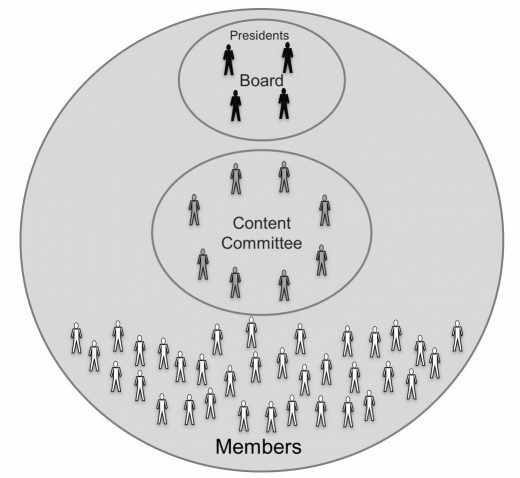 The Content Committee is the core of the organization. This committee makes decisions about changes/extensions of the Architectural Thinking Framework® and approves the association’s publications. It consists of highly experienced, renowned professionals from various fields (such as enterprise/business architecture, business analysis, business process management, Agile, software architecture) that agree to the values of the Architectural Thinking Association®. The Executive Board is responsible for delegating Members to the Content Committee. After the setup phase, in Q1/19, every individual or legal person is encouraged to apply for membership on the association’s website. Once the application is approved, persons become regular members. Regular Members have the right to publish content under the logo of the association. This content can be used for commercial purposes and can remain the intellectual property of the member, but must be approved by the content committee for its compliance to the values of the association and to the ideas of the Architectural Thinking Framework. All regular Members are called upon to create content to become the intellectual property of the association. Regular Members have the right to vote at the General Meeting held via teleconferencing at least once a year.